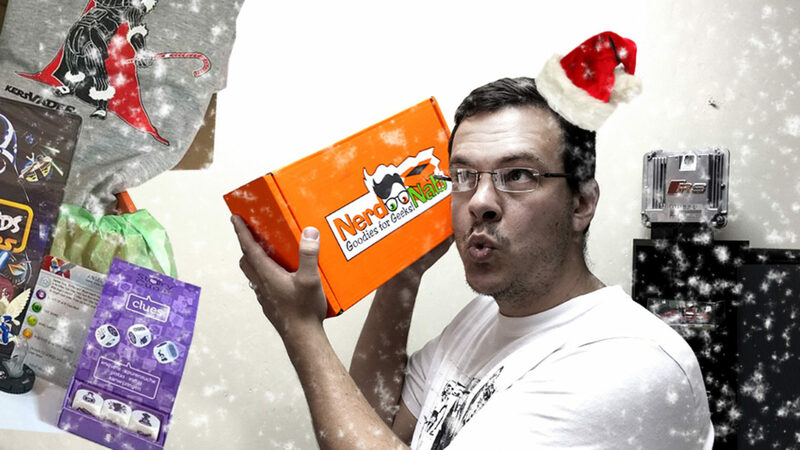 You may remember that we reviewed and discussed the local company known as NerdNab just a short while back and also took a look at what was in store for their first round of goodies. If not, you can always give it a read here. 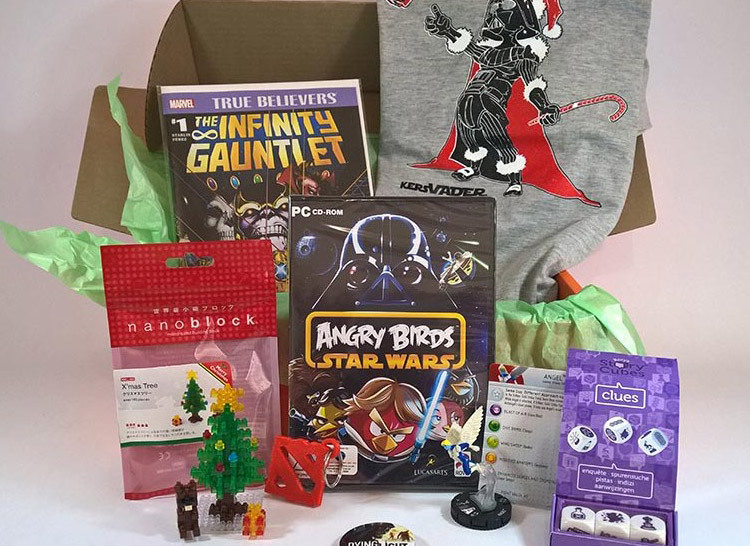 We were sent the second edition box of goodies to check out, and this time the theme was focused around two very important events taking place at the time of delivery, Christmas and the new Star Wars. For everyone who was looking to get more into the Christmas spirit, the box shipped one of three cute little Nanoblock miniatures, and you either got a small Santa, Snowman or Christmas tree. We got three, and it looks cute as hell. For those interested in both the Christmas spirits AND Star Wars, a shirt was included called kersVader, a play on Father Christmas and that other Father (Vader), of course. As you can see from the pics the design is a nice combo and will probably come in handy for the next couple of December Star Wars release dates as well. More Star Wars goodies came in the form of Angry Birds Star Wars for PC and then semi related via their parent company Disney, we got a little Psylocke HeroClix miniature and #1 of Marvel’s The Infinity Gauntlet comic, which as many of you know is the direction that the Avengers and Guardians of the Galaxy films are going. So one little item that came packaged which I was intrigued by, is this little set of 3 cubes with pictures on each side, called Story Cubes. What it is, is essentially a very simple way of playing a game together with some friends. What you do is chuck the dice, and then depending on what images pitch up on each side, you create and tell your own little story to the other players. It’s simple, but its a cute little idea and a super lightweight, small item to take along on a camping trip. Last up, we got some nifty little game-related objects in the form of two pin badges, one for Mad Max and one for Dying Light and then we also got a DotA 2 Logo keyring that was actually 3D printed by some folks who can make custom stuff for just about anyone. 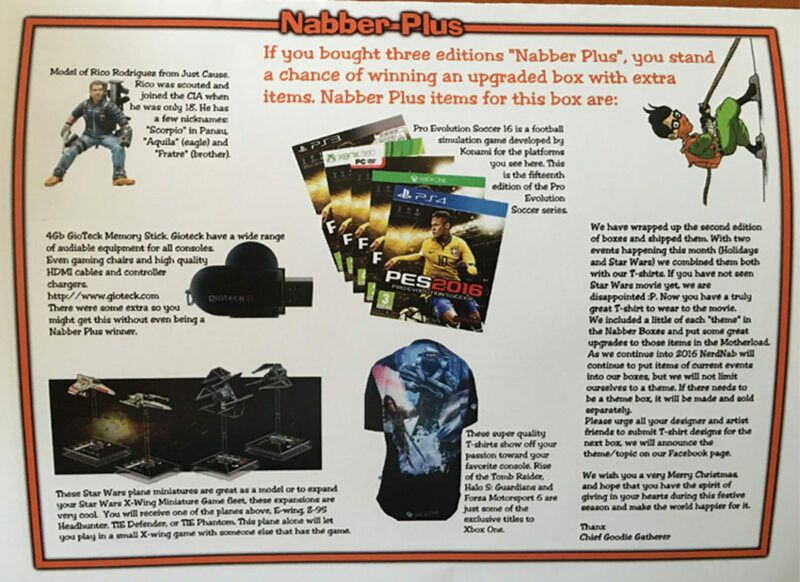 As I mentioned before, some lucky folks will actually get the Nabber Plus boxes and of course, one lucky person gets the Motherload, and it’s just ridiculous. I guess what I like about these boxes is relevant to this theme specifically, in that I think that you get the joy of the surprise of what’s inside, and geeks are going to easily find stuff in here that they like… but… I really like that there’s the immediate feeling that the stuff you aren’t attached to is going to be shared with people you know who may appreciate it, and the love gets spread further and that’s kinda cool that way. Truthfully, depending on who you are and what you like, you can decide whether or not this concept is worth it for you at R350.00, this is something we can’t attach a score to, because it may be your completely cup of tea and it may also be something you don’t like for the given month, but again, you can share the love at the very least. The good news is that you can buy the previous boxes and there are apparently still a few of these available according to the product page I checked earlier. 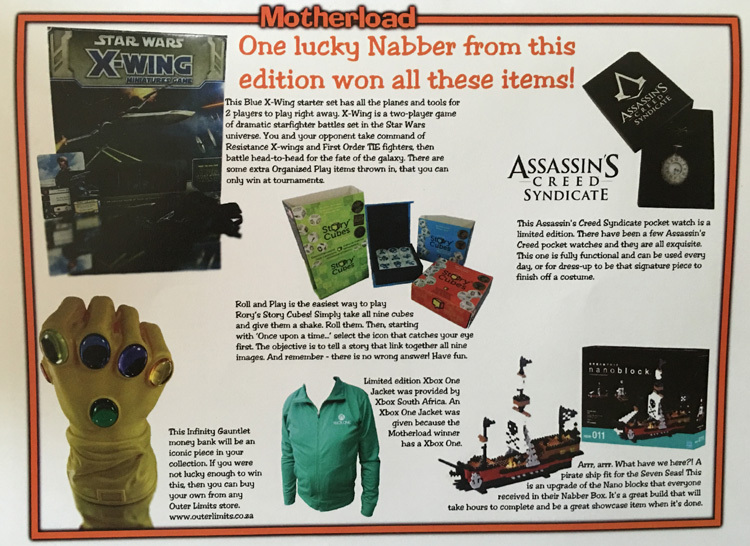 You can obviously wait to see what’s inside and only buy if you like, but then you’re gonna miss out on the chance to bag the Motherload or Nabber Plus, so that’s your call! What do you think of NerdNab? Cool idea or do you hate it? Are you a subscriber?